Construction of their own house or garden is a very interesting and exciting experience. Of course, you can order a unique design from a specialist, but much more interesting to decorate your home yourself. 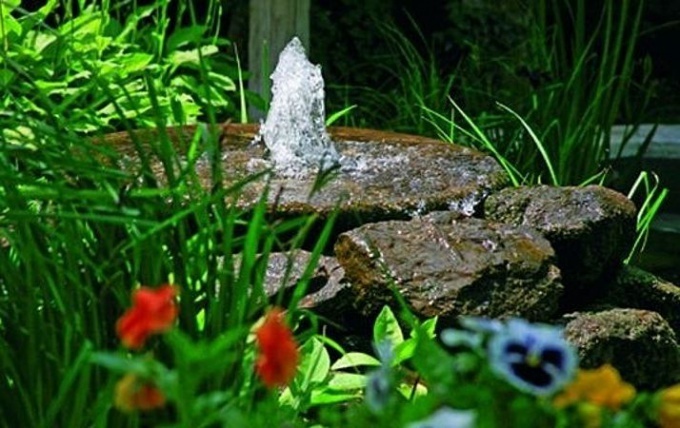 For example, a fountain can decorate absolutely any room. But the installation of the pump requires special enhancements and pumps consume a lot of energy. How to make a fountain without a pump? Three plastic vessels, tubes, sealant, tools, perechodnik, jewelry. First, determine the future size of the fountain. Do not make it particularly large. If you want to have a very large fountain, you should think about the use of the pump, as in this case its use is appropriate. It is best to make a sketch of the future of the fountain. Now, the principle of operation of your fountain. It is best to use the principle of communicating vessels. His pass on the lessons of physics. The bottom line is that if you place two vessels at different heights and connect them with pipes, the water will flow from the top to the bottom. However, the best way to upgrade this mechanism. You'll need to set two vessels at the same height, to connect their two tubes. These tubes connect to the t-shaped perechodnik. When the vessel is water, it will flow down and pour through perechodnik. You can only pour water into the vessels from above and your fountain will work. Find two vessels. Best of plastic. The vessels must be identical to each other. Take the thin tube. Remember, the thinner the tube, the longer it will flow your fountain. Will fit tubes from kitchen filters. Carefully drill holes in the bottom of the vessels. They should be slightly smaller than the diameter of the tube. Then insert the tubes into the holes. Keep in mind that they should be tight to enter. It is best to handle the joints with sealant, or cold welding, to prevent water from leaking past. Now take the third vessel. Its size should be twice larger than each of the upper vessels that the volume of water from the top vessel fits freely at the bottom. Install t-shaped perechodnik at the bottom of the third vessel exactly in the middle. Then drill on the sides of the vessel openings at the bottom. Through them pass two hoses running from the upper vessel. They also should be tightly consolidated. The main part of your fountain is ready. Now you should place the fountain in your chosen location. Remember that the top vessel needs to be at the same level and above the bottom. If you have a fountain on the street, you can not use the bottom container to the water poured directly on the ground. If you use a fountain in the apartment, then do the lower fountain removable to be able to pour water in the top. It remains only to decorate your fountain. It is worth to rely on your imagination and imagination. Carefully check all the pipework and vessels, that they were sealed.